(CBS/AP) MEYERSDALE, Pa. - A penny doesn't go as far as it used to...unless you make believe it's a dime. 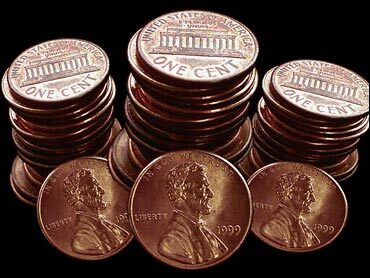 Police in the southwestern Pennsylvania town of Meyersdale are looking for a man who got a lot of mileage out of several rolls of pennies, when he stuffed them into dime wrappers and used the pennies-not-dimes to buy items at a Dollar General store. Police say the thief put dimes on the ends of each roll, so the cashier wouldn't realize they were mostly filled with pennies. A legitimate roll of dimes is worth $5 and this man used eight rolls - meaning the clerk believed the man had paid $40 when, in fact, the rolls contained a fraction of that amount - probably $4 or less, if you do the math. Police tell the Daily American of Somerset the man got away with the merchandise before the clerk realized what happened.